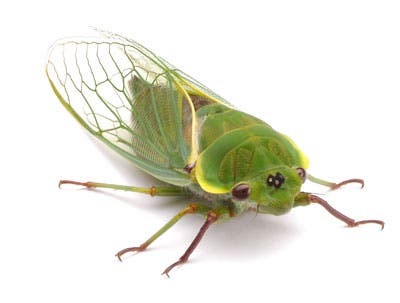 The veined wing of the clanger cicada kills bacteria is able to destroy bacteria by its structure alone – one of the first structures ever found that can do this. The clanger cicada is an insects that looks like something between a fly and a locust; its wings are covered with a vast hexagonal array of ‘nanopillars’ – basically blunted spikes with sizes comparable to that of bacteria. What happens is that when a bacteria settles on this surface, its cellular membrane sticks to the surface of the nanopillars and stretches into the crevices between them, where it experiences the most strain. When the stretch is powerful enough, the membrane ruptures. Lead study author Elena Ivanova of Australia’s Swinburne University of Technology in Hawthorne, Victoria worked with a team of biophysicists to come up with an advanced nanoscale model of how this happens. She explains that the rupture is much like “the stretching of an elastic sheet of some kind, such as a latex glove. If you take hold of a piece of latex in both hands and slowly stretch it, it will become thinner at the center, [and] will begin to tear”. To test their model, the team irradiated bacteria with microwaves to generate cells that had different levels of membrane rigidity. If the model was correct, then the more rigid bacteria would be less likely to rupture between the nanopillars. The results validated their model, but also showed that not all bacteria are destroyed – only those with soft enough membranes. Further study of the cicada’s wing is needed before its physical-defence properties can be mimicked in man-made materials, but doctors are already rubbing their hands, because if this can be replicated, it could be very useful (say) in hospitals and rooms which you want to keep as bacteria-free as possible. “This would provide a passive bacteria-killing surface,” she says, adding that it “does not require active agents like detergents, which are often environmentally harmful”.